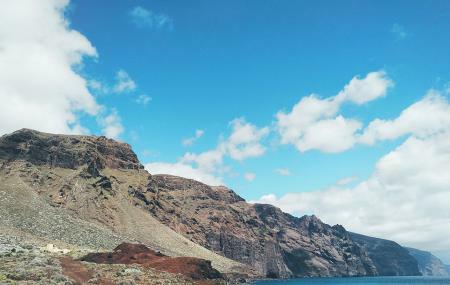 The Punta De Teno to the westernmost tip of Tenerife Island is one of the most scenic spots to enjoy the magnificent waters of the North Atlantic Ocean. The beautiful lighthouse of the Punta De Teno overlooks the rugged volcanic coast against which the waves crash with splash as well as the La Gomera Island and the Los Gigantes Cliffs. The view is more magical during the twilight when the tranquillity of the mountains is penetrated by the scurrying lizards and the sea birds. You can also enjoy fishing or splashing at the coast while soaking in the stunning vistas. I've loved this place! No people, beautiful view. But, please note, if you would like to visit this place at a daylight time - you need to get to this place by walk (about 6 km). But you get a bonus - nice small trip with a perfects views. I kindly recommended this place. So wonderful view during sunset 🌅 Private cars have an access from 19:00 to 10:00. So, it is late to see sunset. Some advise: leave you car near Cruz de Toledo restaurant and take a bus (Cruz de Toledo bus station) which goes to Punta de Teno. It is also the safest since the road to the cape is not easy. Amazing place to come for a swim, to see the lighthouse and meet the sunset. Very picturesque cliffs on the road leading here. A must visit in Tenerife.